Choosing the right roller door for any part of your commercial building is integral to the security, as well as the aesthetic appeal of the property. Commercial roller doors use tracks to roll smoothly up and down. Roller doors generally have a ribbed appearance in the steel due to the way they function. 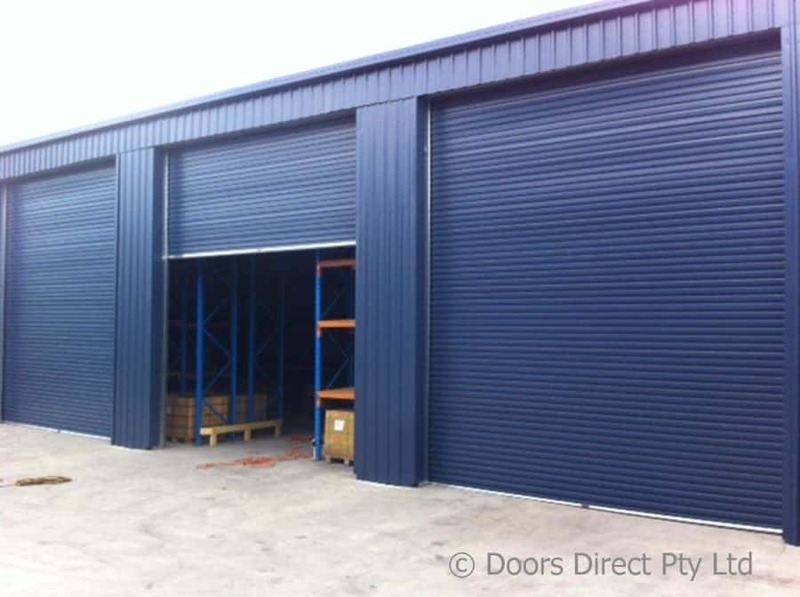 Commercial or industrial roller doors can be chain operated, or can be motorised. Why should I get a roller door? There are various types of roller doors you can consider installing, so why should you choose a roller door over other types? Durable: Roller doors have been manufactured with heavy usage in mind. In fact, under normal conditions, it is able to withstand being raised multiple times a day. This equates to about 20,000 cycles over the course of its lifetime. Of course, in the event that it is going to have to withstand non-standard high cycle use, such as a car park situation, you will most likely want to consult with us before going ahead with the installation. Safe: As with any roller door, it needs to conform to the highest safety standards. When installed by our fully qualified technicians, we spring-balance the roller door to ensure optimum usage. The door will work smoothly and relatively noiselessly, so you can be rest assured that you and your employees won’t be put in danger when operating the door – giving you peace of mind considering the size and the weight of the roller door. Easy to use: Roller doors can be remotely operated, making them extremely easy to use. Employees won’t have to leave their vehicle while entering or exiting the building. Doors Direct can upgrade existing push button motorised doors to ensure they are remote compatible. Customisable: Roller doors are able to be installed in a large range of colours. Whether you want something that will stand, blend in with the colour scheme of your building or match your brand’s colours, you’ll be able to find the right roller door for you. Security: Roller doors can often act as a larger deterrence than other types of garage doors, such as sectional/panel door and tilt doors. Due to its design, it’s difficult to open a roller door without a key. You’ll have peace of mind when you install a secure roller door. Cost effective: You don’t have to worry about going over your budget, as roller doors can be purchased and installed for a relatively cheap price, even when customised. Due to their durability, you’ll find roller doors will be long-lasting, and therefore a very cost effective investment. It’s clear there are lots of advantages to installing a roller door. The only question you’ll be left with is what colour you’re going to choose. Information can go a long way in helping you pick out the perfect door for your commercial or industrial requirements. At Doors Direct, we will make sure that we make this as easy as possible by assisting you every step of the way. If you’ve got any questions about Commercial Roller Doors, please don’t hesitate to contact the Brisbane based team by form to the right or give the team a call on 07 3161 5963.